Want to know more? Listen to what David Getoff has to say about water filtration. Read David Getoff’s latest article on water, filters, toxins, and treatment. AquaMetix® is a proprietary matrix comprising of at least 2 types of activated carbon, combined with crystalline mono and di-calcium phosphate along with chemically active calcium carbonate, structurally bound with polymers in a highly porous block filter form. AquaMetix® will adsorb and/or exchange a variety of organic and inorganic substances, including most heavy metals, chlorine and nitrogen compounds including ammonia, urea and most specifically chloramine. AquaMetix® combines the highest FDA-compliant raw meterials with cutting edge manufacturing methods resulting in unparalled performance in an exclusively USA Manufactured product. AquaMetix® was designed and created by CFCI for the ongoing need for consistent removal of certain contaminants from drinking water supplies in a single stage filter. Years of research and development of the current medias available lead us to the conclusion that new media technology was necessary in order to remedy the problem. 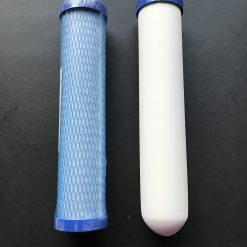 Never before has there been a product available in a single stage filter that can remedy common issues found in water supplies all over the world. 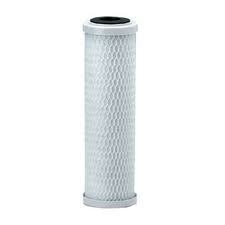 The determination of how frequently to change a filter element should always be based on how much water has passed through the filter. David Getoff recommends the following for an “average” family of three or four persons who do not drink huge amounts of water and who do not also use their filtered water to water their plants. 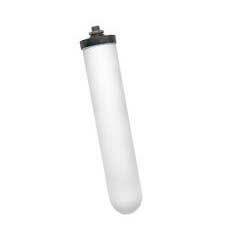 For the Twin above counter or below counter system in non-fluoridated water, if your first filter is a carbon block and the ceramic filter is second, then replace the carbon block once a year and the ceramic every 2 years.